Of course, it is possible to change some features of our lives—at least temporarily. We can change our hairstyles, get makeovers, lose weight, make more money, find love, change careers, or move to a new city and start all over. But our root problem always remains—an inner sinful nature that refuses to change. Many of the changes in your life are a function of self-restraint or self-discipline. If you earnestly want to lose weight, stop smoking, or find a better job, you can achieve those external goals through acts of willpower. But no amount of willpower can change the essentials of who you are. Your intellectual capacity and your genetic makeup are not malleable. Nor, critically, is the fundamental spiritual state you were born into. There is nothing you can do to shed your sin nature. 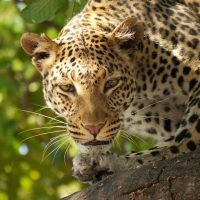 The prophet Jeremiah effectively said as much when he rebuked Israel for their continual rebellion against God: “Can the Ethiopian change his skin or the leopard his spots? Then you also can do good who are accustomed to doing evil” (Jeremiah 13:23). Jeremiah understood the issue we discussed in our previous post—that all men are sinners by nature. He knew that we have as much chance of altering our own nature as changing the color of our skin, or stripping the spots off a leopard. Self-help gurus like Tony Robbins may profess that “we can change our lives. We can do, have, and be exactly what we wish.”  But it’s nothing more than a bogus promise built upon bankrupt theology. Can two words give you the power to change your life? Yes they can! In the pages of his new book, bestselling author Joel Osteen shares a profound principle based on a simple truth. Whatever follows the words “I am” will always come looking for you. Osteen’s book wouldn’t be so offensive if it was properly categorized as fiction. Somehow it manages to adorn the shelves of Christian bookstores as biblical truth.